I could start this week’s forecast in a lot of ways. So much is up right now. Here is what I am noticing: white awakening to structural racism; week after week of horrific violence in Turkey, Iraq, Syria, France (and other places that I am woefully unaware of); indigenous people’s land and survival threatened by oil pipelines; ignorant dependency on extracting that oil; violence towards trans women of color; and the list goes on. And here is what I want us to remember: There is a wild spirit, uncontained by the forces of oppression, that moves through the Earth and the people in love with the Earth, in love with justice, in love with love. This wild spirit cannot be contained. And it is possible to tap into this force and reemerge more healed and stronger. That is the power of this lunar cycle seeded by the root energy of Cancer. Cancer is the cardinal water sign that uses water’s magic to nurture life. Water is the primeval source of that life on our planet and probably all life anywhere. Cardinal signs are the initiators. This lunar cycle, which began in Cancer on July 4, provides an opportunity to reconnect with the roots of life itself, the beginnings. This is big energy, wild energy, healing energy. And we need it. This week’s Full Moon in Capricorn offers balance between the forces that nurture life and the forces that structure life. Oppositions stretch us between extremes, inviting integration. Integration is illumination—a new pathway, a new understanding, a new anchoring can result. We also need this. I am thinking about the political party conventions coming in the next two weeks. So much is at stake and sometimes it feels that no one with power is willing to do anything about it. When I feel despair, I know I can travel back into the wild nature of life that nurtures and sustains me. At the root, I access the birthright of love and possibility. Yes, other roots are there, but this one is too. This is a healing journey. I need this. What roots do you need to access at this time? That journey is waiting for you. Due to my traveling/teaching schedule for the next two weeks, my forecast will be for two weeks. During this time, pressure is building to make change happen, with Uranus stationing retrograde on July 29. Planetary influence is stronger when stationary. Uranus in Aries influences the great awakening that is going on right now. Waking up can create stress, but it can also be joyful and exciting. The Sun’s ingress into Leo, along with Mercury and Venus, encourages a revolution of joy. Leo is fixed fire. Fire is energy that needs to flow and be in exchange with others. Play and creativity are ways to access this flow. The first half of this Cancer lunar cycle was influenced by planets in the water signs. The second half is about fire, yet the intention is the same. Water and fire share a fluid nature, yet are quite different from each other. In fact, it takes great skill to make room for both, as water can smother fire and fire can dry up water. Right balance between our emotional and energetic natures creates a powerful resource for love and healing. As the Moon wanes, we have the opportunity to seek this balance between heart and action. Monday, July 18. If you have never checked out Caroline Casey’s Mythic News, informed by astrology, you really should. [http://coyotenetworknews.com/] She uses a phrase that applies to today, “the tormentors of doom.” These are the befuddling forces of oppression and no fun that want to assert their own importance at the cost of the sacred wild. What I like about Caroline is how she uses humor and story to put these tormentors in their place. As the Republican Convention starts under the influence of a Capricorn Moon conjunct Pluto, let’s envision the shear weight of self-importance crushing the tormentors of doom. Let’s envision creativity and compassion, as the Moon forms a sextile to Neptune in Pisces, as the antidote to despair. 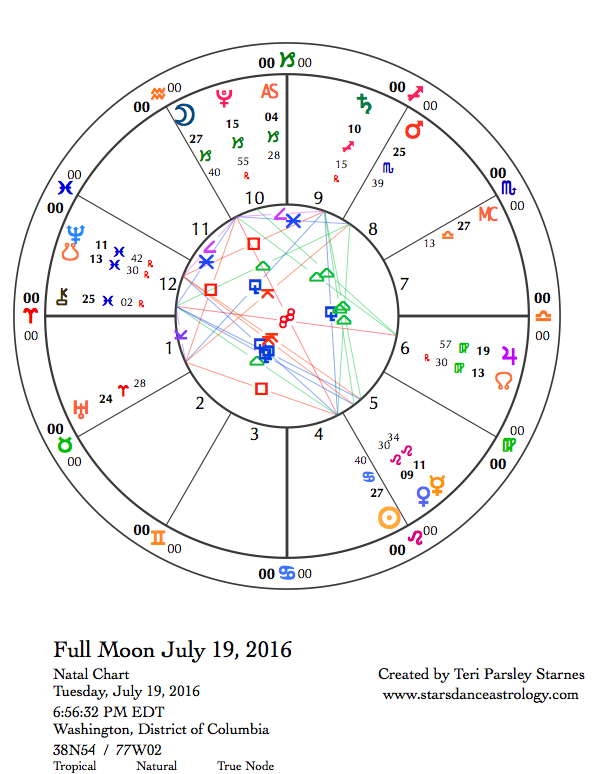 July 19—Full Moon: Illuminating. Cancer’s influence on this lunar cycle has been to offer an opportunity to connect with the roots, the very source of our lives. I imagine water sinking deep into the Earth, with each layer of soil and rock that water moves past being a more primal layer of life. Cancer takes us on a journey into the past. These roots allow us to see where things have gone wrong. This rooting out is also a chance to better support and heal our foundations. Capricorn, the Moon’s sign at this Full Moon, lends an earth sign perspective on our roots. While Cancer may be concerned with nourishment, Capricorn is focused on structure. Our laws, agreements, and rules fall under the Capricorn umbrella. Our values around mastery and accountability do too. These signs need each other to bring balance to our expectations. When we nurture our best selves, we create structures that support the whole. The need to change from the roots up is felt through a square from Uranus in Aries to the opposition of the Sun and Moon. Uranus is the Great Awakener and is particularly strong at this time as Uranus prepares to station retrograde on July 29. It is difficult to be complacent about our roots and structures. We see more clearly the ways we need to repair them. The square between Saturn in Sagittarius and Neptune in Pisces continues to be an influence. Mercury in Leo makes a quincunx to Neptune and trines Saturn, creating complexity about the way we frame reality. Stories have enormous influence. Unexamined stories can keep us sleeping when we need to wake up. This is a good time to reflect on where our stories come from and who they benefit. It is a good thing to question our assumptions. How do we open the locked doors in our minds? Planets in water signs have been very influential the first half of this lunar cycle, increasing the facility of emotional response. The rest of the lunar cycle has more fire. We speed up. There may be less reflection and more reactivity to life. At this Full Moon, reflect on healing and nourishing the foundations that support life so that when fire enflames our passions we are able to act in ways that will sustain life. Wednesday, July 20. Venus in Leo makes a trine to Saturn in Sagittarius. We are feeling creative, engaged, and accountable under this influence. Seek collaboration in the projects that inspire you. Dare to step into the limelight or shine that light on others. It helps to define what is really important. The Moon in Aquarius challenges us to be more objective in our creativity, but that doesn’t mean we don’t get to be inspired. In fact, you may feel that you are flooded with creative ideas. Get them down in concrete form while they are flowing. Thursday, July 21. Yesterday’s clarity becomes today’s self-doubt. Venus in Leo forms a quincunx to Neptune in Pisces. The feeling of vulnerability can actually deepen the ways we are creative and engaged with others. Not every situation is safe, but when you want to cultivate intimacy, it is a good idea to let down your shield and let others see the real you. The Moon in Aquarius makes a square to Mars in Scorpio later in the evening. Differences in emotional expression might cause conflict. Commit to truthtellling and trust in those relationships that matter most to you. Friday, July 22. Sun enters Leo. The Moon enters a water sign just as the Sun moves into the fixed fire sign of Leo, mirroring the dance from water to fire we will be experiencing for the rest of this lunar cycle. We learn to flow from emotion to passion, vulnerability to daring, internal places to external stages. The operative word is flow. Both water and fire have this need to move. Both seek something. Water seeks depth and fire seeks fuel. The combination of water’s depth and fire’s inspiration is profound. Under this influence Mercury in Leo makes a quincunx to Pluto in Capricorn. Perhaps with the strength of intuition (water insight) and passion (fire insight) the desire to speak truth to power becomes hard to ignore. July 23—Disseminating Moon: Sharing. It may be easy to forget that the beginning of this lunar cycle, we were called to tend to our roots through the wisdom and magic of water. How have you noticed water’s influence upon you these last three weeks? On the last day of the Moon’s transit through Pisces (mutable water), today is a good opportunity to reflect on these experiences, which have possibly ranged from deep grief to pure joy. Expanding our capacity to feel a range of emotion helps to strengthen the foundations that support life. The Moon opposes Jupiter in Virgo today. The integration of this opposition between a desire for order and a desire for union creates a healthy ability to draw necessary boundaries while keeping our hearts open. Sunday, July 24. Dare to step into the unknown. That doesn’t mean put yourself in danger, but daring to go past comfort zones can engender that same courage in others. The Moon in Aries makes a trine aspect to the Sun in Leo, we are excited to see what is beyond the edge. Venus in Leo, concerned with connecting with others creatively, makes a puzzling quincunx to Pluto in Capricorn. The tension between desiring affirmation from others and not feeling particularly trusting of others can twist us up in knots. Know your own value. Take the power Pluto offers. Monday, July 25. The GOP Convention began with the Moon conjoining Pluto in Capricorn. The Democratic Convention begins with the Moon making a square to Pluto. Last Monday, I wrote about the “tormentors of doom.” They’re back with a different flavor. Both major parties in the U.S. have their difficulties and the timing of these conventions says the difficulties stem from entrenched power blocs. The Moon in Aries wants to shake up those stale forms. Remembering that this lunar cycle seeded by Cancer is an opportunity to repair our foundations so we may nurture life, this shaking awake is part of the plan. The Moon feeds the creative, engaged, and connected parts of ourselves by making a trine to Venus and Mercury in Leo. Remember to feed life force energy by giving your attention to others. When they, in turn, continue to share attention, we are all fed by the light. July 26—Last Quarter Moon: Evaluating. Just in case things were moving a little too quickly under the fiery Aries Moon of the last two days, Taurus is here to slow it all down. Oh yes, the body has something to say about our lunar intentions this month. There is a reason we need to tend to our foundations. There is a reason we need to nourish life in all its forms. Our bodies remind us of these reasons and perhaps have wisdom to share about how to do those things. The Moon will be in Taurus today and tomorrow. Listen to your body, slow down to the speed of earth, find the stability of a good foundation, and nurture it. Wednesday, July 27. This is an elementally complex day. Fires of transformation are held within a container of earth. Mid-day, the Moon in Taurus creates a grand earth trine with Pluto in Capricorn and Jupiter in Virgo. This structure is the container for a dynamic trine between Mercury in Leo and Uranus in Aries. Mercury and Uranus spark creative ideas and a passion for change now. It may be hard to incorporate this flame with the steadiness that the Taurus Moon is asserting right now. We remember the power of water, emotion, and connection through a quincunx aspect between Mercury and Chiron in Pisces. Perhaps the basis of sustainable change (earth and fire) comes from the healing waters. Thursday, July 28. The final aspects the Taurus Moon makes before entering Gemini are a square to Mercury in Leo and an opposition to Mars in Scorpio. We could wake up in a bad mood, ready for a fight or pouting about being unappreciated. These feelings could be a door to deeper emotional awareness, even when the Moon moves into Gemini, a sign better known for mental dexterity than emotional deftness. The genius of a Gemini Moon is the desire to know more and share it with others. What are you learning? Friday, July 29. The planet of awakening, Uranus, is screeching to a halt and turning retrograde today. That makes this planet’s influence more powerful. What this could feel like is impatience, sudden insight, a desire to break free, a need for authenticity. Under this electric energy, the Moon in Gemini contacts Saturn in Sagittarius and Neptune in Pisces drawing attention to the ways we are seeking to make sense of the world. Uranus asks us to break free from dominant stories that limit our ability to live in truth. Mercury in Leo makes a square to Mars in Scorpio. Perhaps rage plays a part in breaking free. Perhaps speaking the truth in spite of the risks moves us closer to healing the structures that nourish life. July 30—Balsamic Moon: Surrendering. It’s possible that yesterday’s transits felt like a storm breaking. What follows is a chance to reflect on what led to that release. 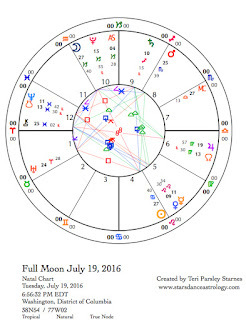 The Moon returns to Cancer, the sign that seeded this lunar cycle at the New Moon on July 4. Through the wisdom of water, I’ve been tracing the patterns back to my roots, seeking healing for that foundation. At this return of the Moon to the sign that initiated my intention, I can reflect on what I have experienced, how I have changed, what I have learned. This phase of the Moon is a time to honor the journey and to surrender intention back to the fertile darkness where new intention gestates. Another shift occurs today. Mercury moves from Leo to Virgo. Mercury rules this sign of service and pragmatism. Perhaps we notice the shift in the season. The end of summer is not far off. Thoughts turn to plans for the fall. Ways to make our lives work better. The work we’ve done on our roots helps us to know better the direction we need to go next. Sunday, July 31. The dynamic relationship between water and fire resurfaces today. The Moon in Cancer makes a trine to Neptune in Pisces, opening our hearts and souls to empathy and intuition. Venus in Leo makes a trine to Uranus in Aries (both fire signs) sparking delight in change. Capturing creative imagination for the purpose of discovery. These elements support each other to flow past barriers, although the day is not without its challenges. The Moon opposes Pluto in Capricorn. The forces of oppression may be strong, but nurturing water is too. Seek restoration and transformation.